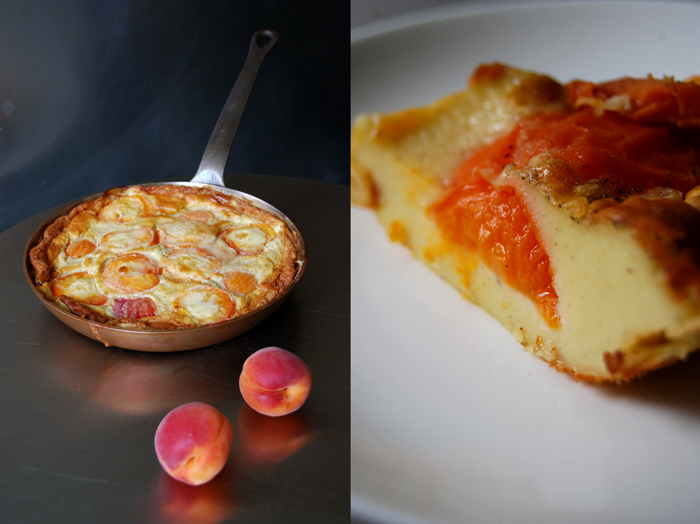 My Apricot Clafoutis is as easy to make as pancakes – and it’s at least as addictive! It looks like a tart but the texture is more like a flan, it’s not too sweet, light and fruity. 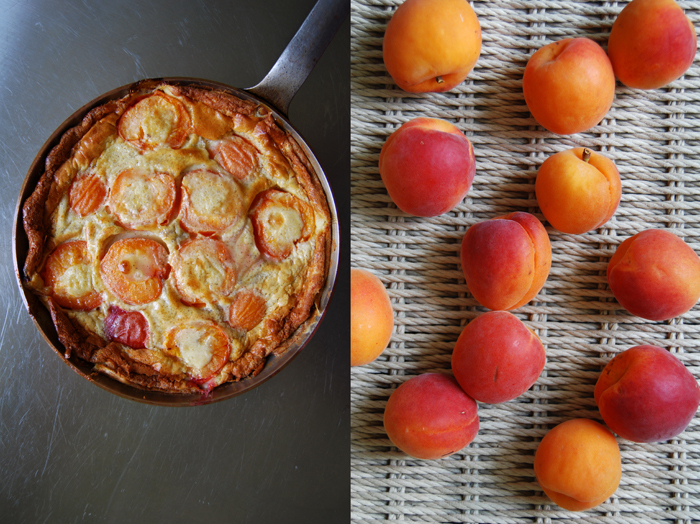 I can imagine it as a wonderful dessert for a summer dinner, sitting outside in a garden and finishing the meal with a pretty French clafoutis. We had a friend over and as soon as the clafoutis was out of the oven, we gathered in my kitchen and waited impatiently for it to cool down a bit. We cut this scrumptious little thing into pieces and it was nearly gone in 15 minutes! It’s one of those sweet treats that you end up eating in one go without noticing. Our guest had never tried this French dish before and he looked quite taken by its taste – he was the first one who asked for a second piece! Traditionally, a clafoutis is made with black unpitted cherries but I needed a cherry break as I ate far too many of them in the past few days. 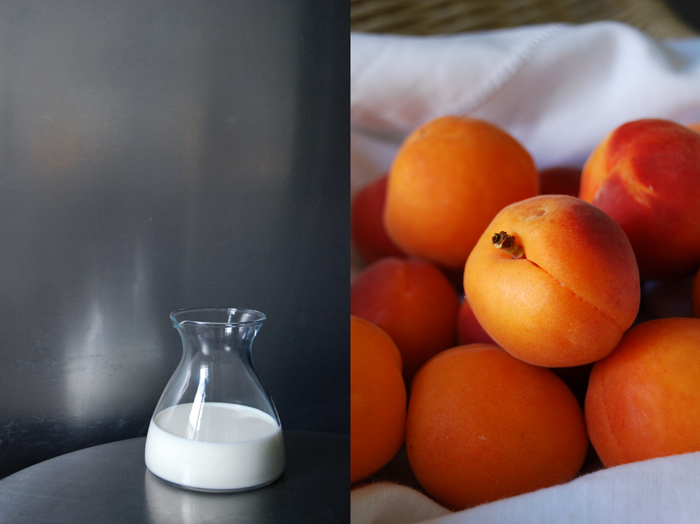 Apricots were my first choice, and I almost prefer them in this dish. I like how they blend in with the vanilla flavoured batter. They aren’t as sweet as peaches or cherries which fits very well in this composition. I also left out the traditional icing sugar on top, all the flavours were so well balanced that I didn’t feel the need to add more sweetness. Set the oven to 190°C / 375°F (fan-assisted oven) and butter the pan generously. Combine the dry ingredients. Whisk the milk, eggs, brandy and melted butter and pour into the dry mixture, mixing constantly until well combined. 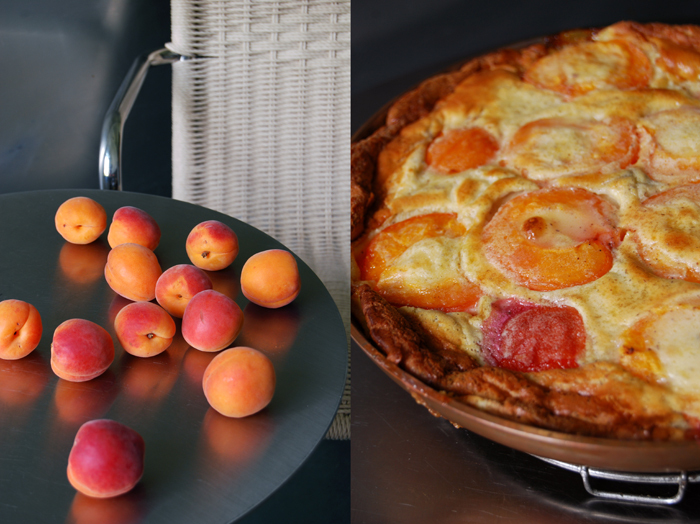 Spread the apricots in the pan and pour the batter on top. 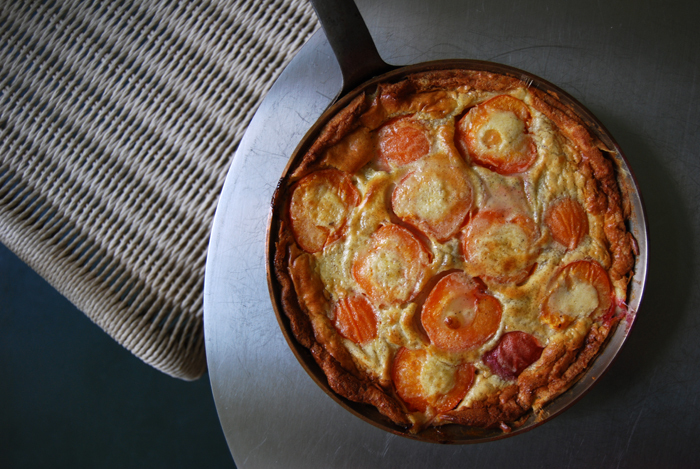 Bake for 20 minutes, turn the oven down to 175°C / 350°F and bake for another 8 minutes or until the clafoutis is golden and set. Let it cool for 5 minutes, leave it in the pan or turn it around and sprinkle with icing sugar if you like, serve warm. I agree with you Meike : it’s totally addictive ! I put it out of the oven 30 minutes ago and it had totally desapear (and we are only two people at home…). I’ll try it later with plums. Perhaps these fruits are too juicy for this recipe, but I’ll test. Hi Catherine, wow, that was quick! I’m happy we’re not the only ones who empty dishes within minutes! Please let me know how it works out with the plums, I’d love to try that! This looks delicious and I would love to make it. I don’t understand what sugar EL means in the recipe. Also, does a pinch of fresh vanilla mean vanilla bean? That was a mistake, it’s 4 tablespoons of sugar, I changed it in the recipe. Yes, that’s right, it’s a pinch of vanilla scraped out of a bean. 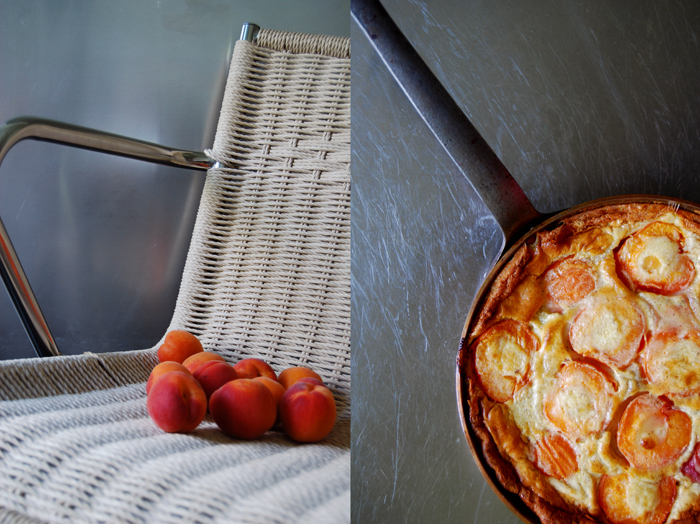 Have a nice Sunday and enjoy the clafoutis! Thanks so much for your quick reply! I look forward to making this!